It wasn’t enough that Vijay Singh emptied some PGA Tour offshore accounts with his pre-trial settlement over a deer antler spray violation gone public, but who saw an image rehab social rollout as the cherry on what was probably a multi-million dollar Sunday? Here’s Vijay living under par in not one, but TWO almost random PGA Tour Champions Instagram posts to kick off the New Year. There is no truth to rumors that negotiations broke down over Vijay’s insistence these propaganda pieces appear on the PGA Tour account. You know, the PGA Tour he plans to take up spots on this winter instead of sticking to the Geezers tour, where he has a chance to record top 10’s. 💪💪 @vijaysinghgolf is GRINDING heading into the season! Set your goals high like @vijaysinghgolf. If he doesn’t win the Schwab Cup Championship in Phoenix this week, Scott Parel will need some help from Bernhard Langer and others to claim the $1 million prize. Still it’s been a while since the PGA Tour Champions has seen someone who played so little PGA Tour golf (five starts at age 38) turn into a leader money winner and potential Schwab Cup champ. Parel didn’t even join the paid ranks until he was 31 years old, after a decade in the IT industry. He made just five career starts on the PGA Tour, and it wasn’t until 2003, when he was 38, that he secured Web.com Tour status. He made 18 starts that year and earned $3,344. His lone win came in 2013. By then he was 48 and turning his attention to the over-50s circuit. With no playing privileges, Parel had to rely on Monday qualifiers, a system that offers odds only slightly better than a Mega Millions lottery drawing. He made it through eight times that first season but remained realistic. While he faded to a final round 77, Tom Watson's opening 69-68 in the Senior Open at St. Andrews and continued contention until early Sunday was a thing to behold on many levels. But as John Feinstein notes for Golf World, with it only being Watson's fifth start of the year due to wife Hilary's battle with cancer, the ability to perform as the 68-year-old did was something special not to be overlooked. the Senior Open was his fifth event of 2018 and he hadn’t played anywhere since April. The reason for his absence was simple—and sad: His wife, Hilary, has been battling cancer. There was no way he was leaving her side during chemo and radiation treatments that began last fall. Only during respites in her treatment—at her urging—did he play. A few weeks ago, Hilary Watson completed yet another painful round of chemo, this time in Houston. Still, she wanted her husband to play at St. Andrews, a golf course and a place he loves. The Forecaddie weighed in on the proceedings from Scotland where many Americans made the voyage. Well done to all of the geezers who crossed the Atlantic in an effort to play this week's Senior Open at The Old Course. Golf Channel analyst Brandel Chamblee will make his first professional appearance in more than ten years after successfully qualifying for The Senior Open Presented by Rolex. The American, who made his last appearance on the PGA Tour in 2008, was one of 27 golfers who came through qualifying to book their place on the Old Course at St Andrews from July 26-29. A record 591 qualifiers took part in the traditional Monday Qualifying at Fairmont St Andrews, Ladybank, Lundin Links and Scotscraig, with participants from all four corners of the globe descending on the county of Fife. The 56 year old, who shared first place at Scotscraig Golf Club, said: “St Andrews means a lot to everybody in the golf world, but it holds a special place in my heart because I spent the summer of 1982 in Scotland. One of the highlights of my career was playing in The Open in 1995. “So to bring my career in the game full circle, from the amateur game, to the PGA Tour, to the Senior Open, I couldn’t be happier to have made the field and to play amongst some of the best players to have every played the game. Joining Chamblee from Scotscraig were compatriot John Inman and English amateur Robert Maxfield – CEO of the Professional Golfers’ Association. Also earning their spots were Victor Casado, Vicente Fernandez, Darrell Kestner and amateur G.S. Lacy. The first results of qualifying came from Ladybank as Fran Quinn finished first on three under par. He was joined automatically by Tommy Tolles and David Shacklady, who successfully earned his Staysure Tour card at Qualifying School earlier this year. A five-way play-off was required for the final four spots, with Bob Ford, amateur Ryan Howison, Mark Ridley and former Walker Cup player Gary Wolstenholme securing their places on the first extra hole. At Fairmont St Andrews, the closest Qualifying venue to the Old Course, Spain’s Andres Rosa was the only golfer to finish under par – one stroke ahead of David Mills and Henrik Simonsen who finished level par with rounds of 72. An eight-man play-off decided the final four spots with Sweden’s Mats Dornell joined by fellow amateur Gene Elliott, Bill Breen and Pedro Linhart taking the spoils. Six spots were available at Lundin Links, with Gary Koch – a colleague of Chamblee’s - and Jonathan Cheetham sharing first place on three under par. Angel Franco, amateur Michael McCoy and San Filippo qualified automatically on two under par. A six-man play-off determined the final place on offer for this year’s Senior Open, and play was suspended on Monday evening due to darkness with three players still in the hunt. After play resumed at 8am on Tuesday morning, Australia’s Paul Archbold became the last man in after negotiating nine extra holes. The successful qualifiers will join a host of golfing greats at St Andrews including Ryder Cup Captains Sir Nick Faldo, Colin Montgomerie, Tom Watson, Ian Woosnam, and defending Senior Open champion Bernhard Langer. Tickets starting at £15 can be purchased at st.golf/SeniorOpen18Tickets, while under-16s and parking are free. The former Cy Young Award-winning and Hall of Fame Atlanta Braves ace tees off in the U.S. Senior Open at 7:21 am MT with Jim McGovern and Bob Ford. Now Fox's lead baseball analyst with Joe Buck, Smoltz will be playing in a USGA.org exclusive window and in Fox Sports 1's Friday broadcast time. Couples: "I think my time's running out." Golf World's John Strege talks at length with Fred Couples, who considers his made cut and T38 at the Masters a victory given the poor state of his back. Couples gives it a go at this week's U.S. Senior Open and at the Senior Open at St. Andrews but beyond that he's not sure he'll play much more competitive golf. To test his back, “to see if I could play,” in advance of the senior event last week, Couples played in the member-guest at his home club, Big Canyon Country Club in Newport Beach, Calif. “I played a practice round and three days, and I didn’t move very well Sunday or Monday. “To be honest with you, the last couple years my back has been not so good." The U.S. Senior Open at The Broadmoor gets underway at Thursday and John Daly has withdrawn, citing the USGA's refusal to grant him a cart. Daly made the request, the USGA says it wanted more information and Daly claims that is not the case, so he WD'd. Bob Dyer of the Akron Beacon-Journal reacts to news of the PGA Tour leaving Firestone for Memphis, and providing a Senior Players as the consolation, writing that it's "equivalent of going from Major League Baseball to AA." Dyer notes the rumors of FedEx demanding WGC status for the Memphis stop and player affinity for Firestone as reasons to be dismayed, but ultimately can't get past the loss of big names coming to Akron. Area golf fans no longer will be able to rub shoulders with household names like Tiger Woods, Phil Mickelson and Rory McIlroy. No more Dustin Johnson. No Rickie Fowler. No Justin Spieth. In this week’s rankings, the top three players on the Senior Tour are Bernhard Langer, Steve Stricker and Scott McCarron — prominent former PGA Tour players, to be sure, but hardly living legends. Dyer says it all came down to the cost of World Golf Championship sponsorship and has pretty good sources on that. 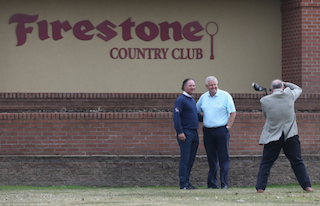 Gordon Knapp, CEO of Bridgestone Americas, said Thursday that his company would have been permitted to keep the WGC event in Akron had it anted up enough money. But clearly Bridgestone’s sponsorship budget is lower than FedEx’s. “We looked at where the PGA was going with their … pricing, and frankly, we had to take a step back and take a look at our own portfolio of sports sponsorship packages,” he said. He declined to disclose any numbers. It's not typical to see a CEO call out the price increase like that, so was Bridgestone made an offer they had to refuse, or is the WGC pricing really on the upswing for all sponsors? The Big Timer Billy Ray Charlie Rymer returns to competitive golf this week at the Boca Raton Championship. The former U.S. Junior Champion turned Georgia Tech star turned tour player turned morning television personality became eligible for the PGA Tour Champions. He's documenting his return in Rymer Reasons vlogs exclusive--EXCLUSIVE!--to GolfChannel.com. Poll: Should The Governing Bodies Drop The Anchoring Ban? At the very least, Langer is taking things right up to the edge of the anchoring ban. At the worst, he's openly resisting the rule knowing that the genteel world of golf would never actually prosecute a player of his caliber. The "integrity" language here from the USGA would suggest that actually enforcing the rule is now almost impossible given the introduction of intent. With this in mind and knowing there are seniors whose golfing lives were made miserable by not being able to anchor, perhaps it's time to drop a rule that will not be enforced? The SI/Golf.com gang contemplated massaging or changing the rule in this week's discussion that included caddie John Wood. Given the potential rules changes for 2019, should the governing bodies consider abandoning a rule that started in 2016 after much debate? As part of the rules revisions, should the governing bodies drop the anchoring ban? An AP story lays out the (mostly horrifying) details of German insurance giant Allianz's battle to not pay out $2.5 billion in insurance policies to Holocaust survivors. The issue with Allianz even enjoys rare bipartisan support in Florida from Senators Bill Nelson (D) and Marco Rubio (R), along with U.S. Rep. Ileana Ros-Lehtinen (R) of Miami. The company says protests at the Allianz Championship in Boca Raton did not impact the sponsorship issue. ''While none of us can undo the past, we must confront it,'' spokesman Christian Kroos said in an email. Hollis Cavner, CEO of tournament organizer Pro Links Sports, said Allianz told his firm years ago it would not renew its contract when it expired after the 2017 tournament. A new sponsor is expected to be named soon. Sports Illustrated's annual anonymous players poll is always fun, but the questions were more clever than ever this year and the responses are all worth looking at as long as you can handle the motion sickness that comes with reading golf.com. You won't be shocked to know that the male players are not Hillary fans, but the LPGA's finest also don't sound too excited. In the "If you were to be in a bar fight" question, Ernie edged Keegan. Congrats guys, you are considered the most likely to do damage when inebriated! The most alarming question may have been the apparent hostility many players have for paying caddies 10% after a win. Does the caddie deserve 10% of a winner's check? Loose Lips: "Maybe more like 8%." The Donald seems to be embraced by the players, with Trump Doral surviving 45% to 39% in favor of keeping the Doral event. In the voting booth, Trump carried the PGA Tour votes 34% to 22% for Undecided. The other shocking result that speaks to the vitality of the almighty dollar: players would rather win The Players than an Olympic medal. The Players or a gold medal? The Texas Open or a gold medal?